Android vs. iOS: Which Is More Likely To Drive App Revenue? There are steps that must be taken to ensure that your great app idea comes to fruition as a profitable one. Mobile, web and IoT apps can be lucrative for those who take the necessary steps to define their apps’ functional requirements and develop a high quality product capable of revenue generation. Once the guiding principles and fundamental user scenarios of an app have been defined, app creators must evaluate which platform and devices to develop and release their apps onto. Web-based apps are platform agnostic, providing a centralized offering to users of any mobile device—from iPhone and Android to Windows. The main benefit of a web-based app is that engineers and developers only need to maintain a single code base. For this reason, enterprise apps are often web-based. Web-based apps, though easy to manage, lack certain capabilities that bolster app performance and user experience. Compared to native apps, web-based apps tend to perform more slowly as static and dynamic content must be downloaded from web servers. They also lack access to all smartphone devices’ hardware features, making localization and other UX improvements unattainable. For app creators whose competitive edge is dependent upon inventive product design, web-based apps are less favorable than native apps. Cross platform tools such as PhoneGap/Cordova and Xamarin provide a way to package web-based apps as native apps, but they still suffer from similar performance issues. Native apps are built for specific app platforms using code libraries that are stored locally on users’ devices. They rapidly present static and, in some instances, dynamic content without being slowed down by content that must be accessed and downloaded from the web. Hardware features such as cameras, GPS and NFC can be easily integrated into the design of native apps for UX enhancements. According to recently reported data, nearly 95 percent of mobile and tablet devices are operated on iOS or Android. The decision of whether to develop a native app for iOS and/or Android must be weighed against some important considerations. App developers, unfortunately, are unable to design apps for one platform and readily duplicate them for the other. Both platforms require different design languages and have different interface requirements. 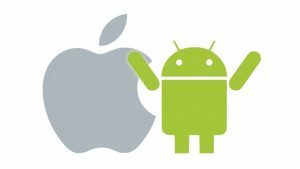 Despite the fact that the majority of smartphone users are on Android, many of the most successful apps have historically been released onto iOS before being released onto Android’s operating system. Apps released onto the App Store are known to generate more revenue than those released onto Google Play. A recent report found App Store revenues to be 90 percent higher than that of Google Play for Q1 2016. When deciding between iOS and Android, it becomes a question of size versus size of prize. Android’s operating system best suits those developing apps with ad-based revenue models given their more expansive reach of smartphone users. App creators basing their revenue generation model on in-app purchases should consider taking an iOS-first approach given that their users have higher purchasing power on average. Android’s reach is considerable enough to not be ignored, as is Apple users’ higher spending patterns. Together, both platforms can service the requirements of the overwhelming majority of target users, and address the business needs and goals of app creators. Rather than approaching your operating environment decision as an either or, consider it as a matter of timing. Those developing apps for already existing customer bases typically release apps onto the App Store and Google Play simultaneously to keep everyone satisfied. New market entrants, on the other hand, have more flexibility over when to release their app onto either app marketplace. Preference should be determined based on the demographics of the target userbase. Whichever platform is most used by the app creator’s target userbase should be rolled out first. When ready to expand the app mass market, the first-released native app can be optimized for and released onto the other platform in little time. Cross-platform mobile app development tools work for some, but not all, app creators due to feature and design related limitations on user experience.